Last week, from August 26 through September 1, I got in another 90+ mile week, a rarity in my running “career”. I totaled just over 94 miles but, if I push myself through tomorrow, I think I’ll be able to log my first ever 100-mile week (excluding the 2009 TransRockies Run event). Hitting 100 miles is totally arbitrary, as so much of the wear and tear and physical benefit from running comes from not just mileage but a combination of intensity, terrain, elevation, vertical change, weather, and other varied factors. But hitting 100 weekly miles, especially in my build-up to my first 100-mile race, holds special meaning for me. So I’m going for it. Currently, I’m just shy of 81 miles over the last 6 days. My plan is to get a second run in this evening then run whatever I need to tomorrow to make it official. Interestingly, some of my 70-80 mile weeks up here, ones that have included much more vertical, have been more challenging but I like the objective measure of mileage, at least for this very short term goal. Eric Lee succeeded in completing the insane challenge of the Nolan’s 14 route. I’m glad to have a chance to run with Eric and look forward to more trail time together whenever he’s ready. I’m looking at one last training race before the Cactus Rose 100. The 50k at the Bear Chase Race seems about right. Today was my first stroller run with Story. I’d say it went pretty well. She slept the first hour, played with her toes for the next 30 minutes, then cried the last 10 minutes home. Sort of a baby triathlon. Weather report for tomorrow: Boulder, high 72, low 48. Austin, high 104, low 75. I can just hear the regular refrain from my beloved Austinite friends, “It’s only really hot here for a few months.” The thing is, I can remember back to May 6th, when it topped out over 100 degrees during a trail marathon I ran. That was 4 months ago and Austin’s forecast calls for at least mid-90s well into next week. Lean is good, skinny is bad. 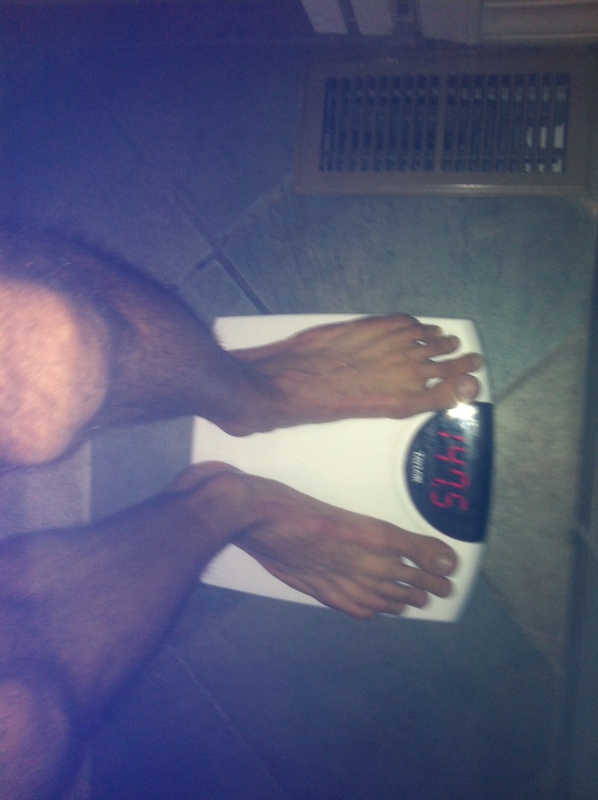 I hopped on the scale after my long outing on Saturday and looked down at a number last seen around my sophomore year. In high school. I just drank another 48 ounces of protein shake but it just doesn’t seem to make much difference. Pfffft! I’m going for my first total 5 miles running this week. Power walking should add another 6-8. Thanks for the inspiration, though! Congrats on running! But, of course, there’s nothing wrong with power walking/hiking. In fact, virtually all ultra-“runners” spend a big chunk of long outings moving at 15-20+ minutes per mile. A good walk/hike can be quicker than a slow run and usually is more gentle on the joints and muscles. In any case, moving vs. not moving is far more important to good health, happiness, and adventure than pace. Jared Campbell & Matt Hart finished the Nolan’s 14 in 58 hours 58 mins. They were #5 and 6 for that challenge since its existence.